Ballinger has a beautiful Historic City Park located on the Banks of Elm Creek. The park has a full time caretaker and is kept clean and well maintained. The park offers a beautiful setting with green grass and large pecan shade trees ideal for Family Reunions and social functions. The City Park is located at the bottom of the hill of which the Community Center is located, so both facilities can be easily utilized together for events. Added in the Spring of 2013 is the Imagination Station, a playground built by the City of Ballinger and volunteers from the community. The 7,400-square-foot playground is a clean facility for Children to play and be safe in. Learn more about the Imagination Station at the Park here. The park offers RV Connections and facilities at very reasonable competitive rates in a beautiful relaxing setting. The CityPark has one of the nicest Municipal Swimming Pools in the area. Large, newly constructed, it is well maintained and clean. 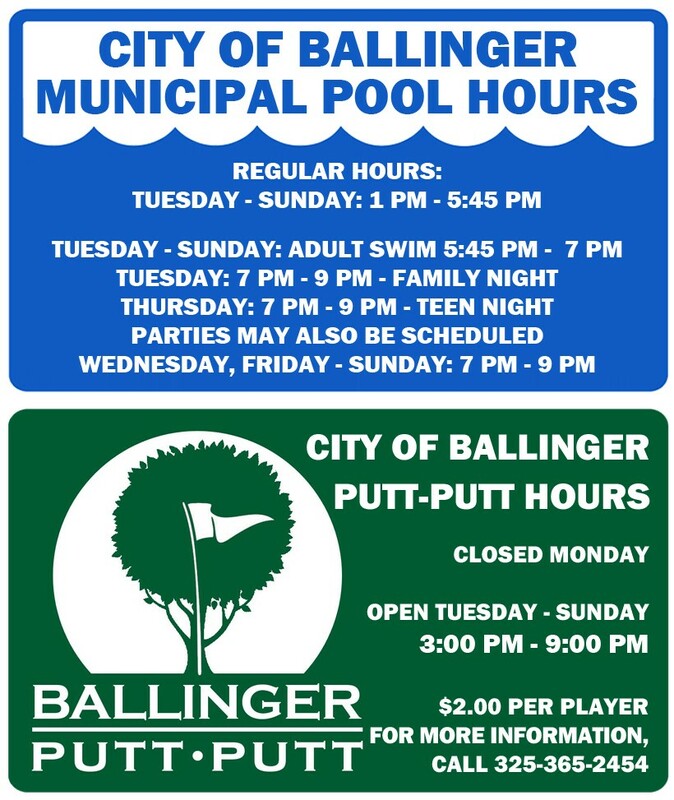 Ballinger Constructed a new and modern pool which opened in the summer of 2003. The facility is one of the nicest pools found in any community. Ballinger is very proud of this new assets for the recreation of it’s citizens and visitors. Located within the City Park is an 18 hole Miniature Golf Course.